Hi there! Welcome to the fourth day of the January Neat & Tangled release countdown! All of the new products will be available in the Neat & Tangled Store on Friday January 5th at 8:00 am EST! My card today is showcasing the new Dazzling stamp set and coordinating die. First I stamped the image with VersaMark ink onto Bristol Board, and heat embossed with white embossing powder. I then used Peacock Feathers Distress ink and blended over that. I sprinkled with water and then with some of the same ink diluted with water. I cut my background out with the Scalloped Dies, and adhered that to the card panel with foam tape. I then stamped the image again on white card stock, colored it with Copic markers, and cut it out with the coordinating die. I adhered this with foam tape, then I added some Stickles glitter glue to the little white embossed sparkles. Be sure to stop by the Neat and Tangled Blog to see all of the design team inspiration! Don't forget - there is a giveaway every day this week of the set(s) being featured that day, and a $25 gift certificate up for grabs at the end of the week. Comment on all of the design team blogs all week for a chance to win. Winners will be announced on the Neat & Tangled Blog Friday at 7:30am EST! So pretty, Kay! I love your rainbow colored "gems!" (can't think of the word for those shapes-too early for me, I guess) But they sure are pretty. The background looks terrific as well. Really like the scalloped shape. Lovely work! :) Hugs! Wow, Kay, this is just gorgeous!! I love the blue background with the white embossing. It looks magical, especially with the beautifully colored gems in front. Pinned for inspiration! Such a fun card. I love your coloring and the glitter gives that right final touch. Sparkly! That's so beautiful. 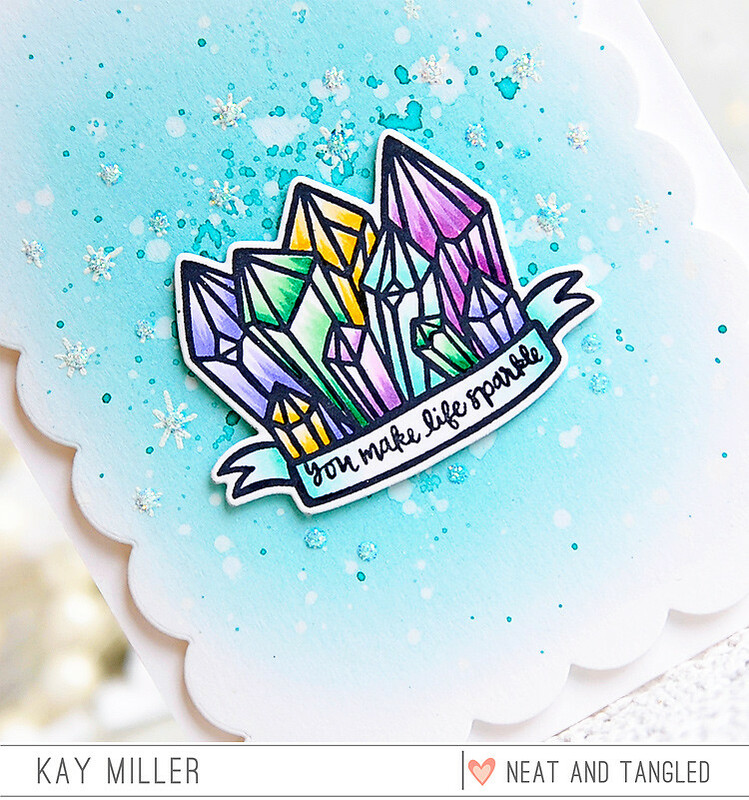 I love the way you colored the crystals and that background sets it off nicely. Beautiful!! And your coloring is fabulous; it really gives dimension to those gems! You make your card sparkle! This is beautiful, Kay! I love the colors you chose for your sparkling gems. Gorgeous card!! I love how you created the background!! Love the pretty range of colours on this card. Thanks for the inspiration. Just gorgeous! Love the background! Great card, your background effect really gives the sparkle effect, the gems just look like they give off a glow. Gorgeous! Love the white embossed sparkles. Your blue background sets off the gems perfectly! Love the beautiful background with the sparkles, and your gems look fantastic! Such sweet soft crystals and love the background. That’s a fantastic card design ! And the background is awesome ! So pretty. Love the sparkles. So pretty! I love the splatter and sparkle you added to the background! So cool! Love your coloring! Hi Kay, Your card is so pretty. 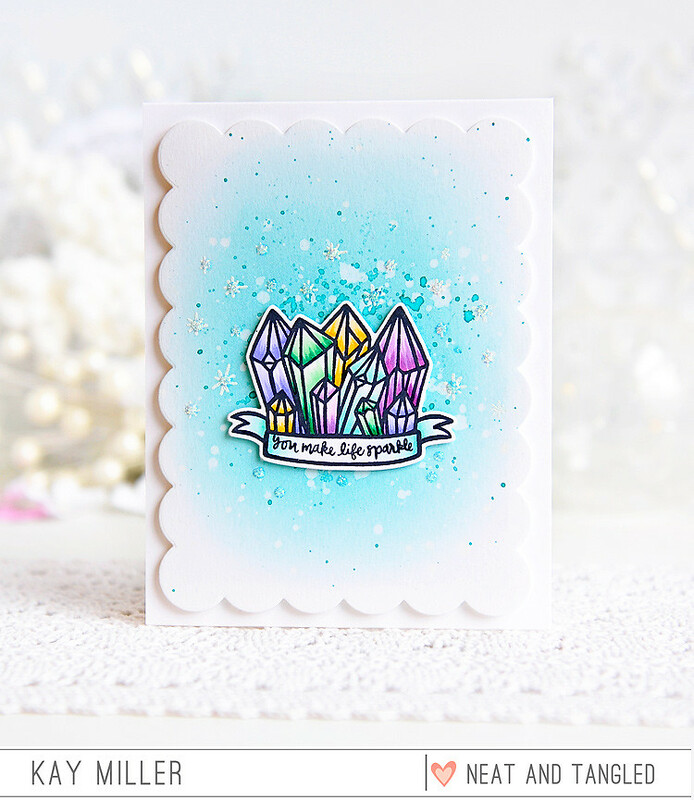 I am loving your watercolor backgrounds and the srickles give the crystals extra sparkle. Thanks for explaining how it came together! The background really highlights the image. Beautiful. I like the background for these colorful crystals. You've created the perfect background for this Kay! Pretty card!! I love how you made the crystals glisten...beautiful job! So pretty. I wasn't sure about this stamp but it just keeps winning my heart. Pretty card - love the colors. Pretty card! I love those gorgeous colours on the bright blue background! This background is so dazzling.. love all the texture and the soft blue .. lovely card and set. Beautiful coloring and inking Kay!